Happy Monday, Friends! Today, I’m excited to share with you the health benefits of one of my favorite foods—mushrooms. Whether I’m putting together a savory side dish using my favorite white vegetable or making a creamy, delicious, healthy mushroom soup (I’ll share that recipe later in this post! ), I always feel good about consuming mushrooms because I know that with each delicious bite I’m doing my body so much good. I felt compelled to share my love of “medicinal mushrooms” with you today after a walk through my local Whole Foods last week. I was actually there shopping for fresh mushrooms to make my family soup, when I noticed an overwhelming amount of new “mushroom products” on the shelves. As I strolled through the aisles I found mushroom elixirs, mushroom coffee and mushroom hot chocolate blends. I found mushroom broths, mushroom granola bars and new flavored ‘crispy mushroom snacks’. I even found new mushroom beauty products like soap and shampoo. I immediately went home and read up on the current popularity of “mushroom products”. 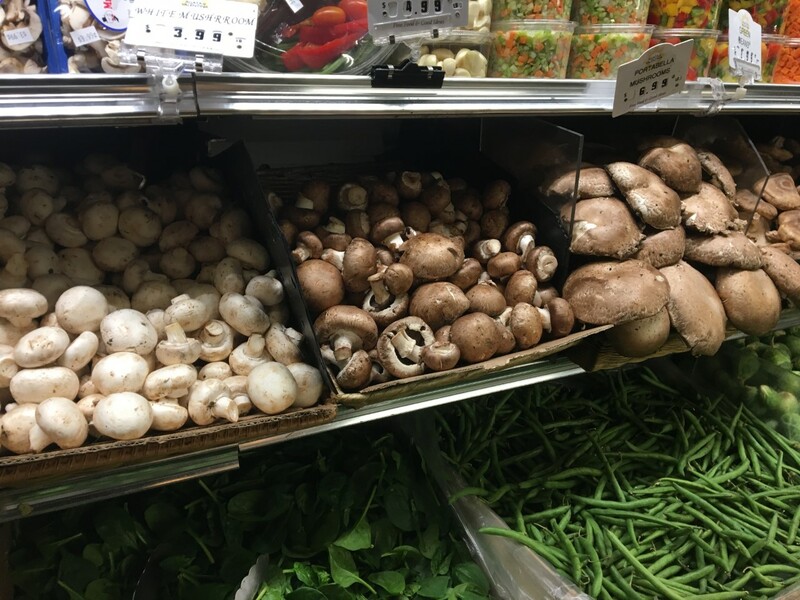 Whole Foods recently predicted that mushrooms were one of their trendiest superfoods of 2018 and reports from Grand View Research stated that the mushroom market as a whole is expected to reach $50 billion in the next six years. I have to say that the popularity of mushrooms comes as no shock to me. I’ve been a lover of mushrooms my whole life and became a true believer in their medicinal properties and importance in our diets during my studies to become a nutritionist. 1. They are full of antioxidants. Antioxidants help protect the body from damaging free radicals that can cause conditions like heart disease and cancer. They also protect you against damage from aging and boost your immune system. Mushrooms are rich in the mineral Selenium which is exceptionally important for both body and mind health. 2. Mushrooms are high in fiber; more specifically they are high in beta gluten which is a soluble dietary fiber that has been strongly linked to improving cholesterol and boosting heart health. 3. Mushrooms are rich in the B vitamins: riboflavin, niacin, and pantothenic acid. This combination helps protect heart health. Riboflavin is good for red blood cells, niacin Is good for the digestive system and for maintaining healthy skin (hence the new mushroom beauty products I mentioned above) and pantothenic acid is good for the nervous system and helps the body makes the hormones that it needs. 4. Mushrooms are a good source of Copper. Copper helps your body make red blood cells which are used to deliver oxygen all over the body. 5. Mushrooms are rich in potassium which is extremely important when it comes to heart, muscle and nerve function. 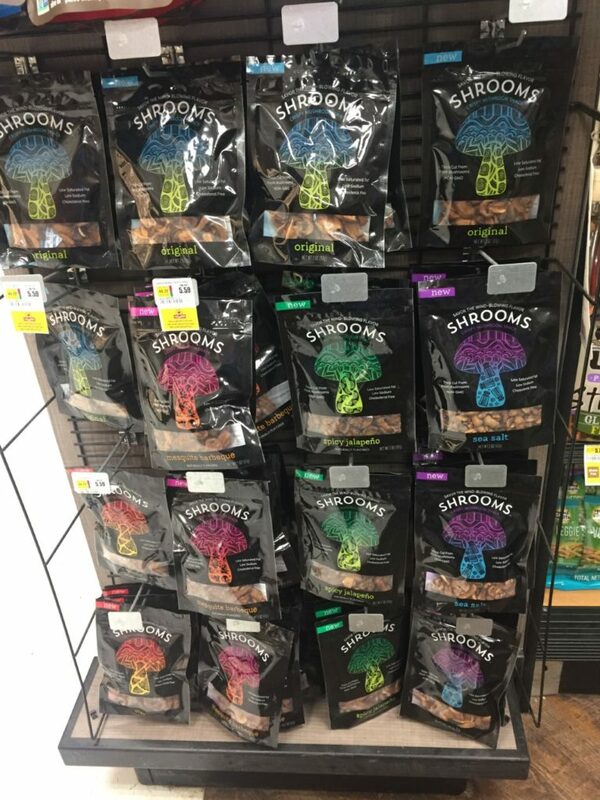 But what might possibly be the reason for the current popularity surrounding mushrooms is the most recent scientific studies claiming that two portions of mushrooms each week could cut your risks of brain decline that leads to dementia in half! Huge findings about one little vegetable. Mushrooms contain an amino acid called ergothioneine or ET which the body can’t make for itself and which is found in particularly low levels in people with natural brain decline and dementia. You can read more about that recent study in its entirety here. I think that another cause for mushrooms recent popularity is our “want” as a society to be as healthy as possible and give our bodies exactly what they need to function to their highest level while also “needing” products that are easily and quickly consumed to do just that. 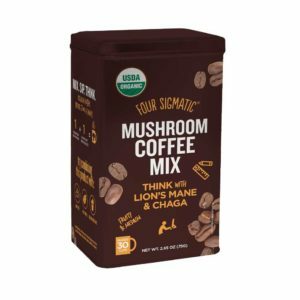 These new mushroom products on the market aim to provide all the health benefits that consuming mushrooms can provide you with in one simple little coffee, hot coco or crispy treat. 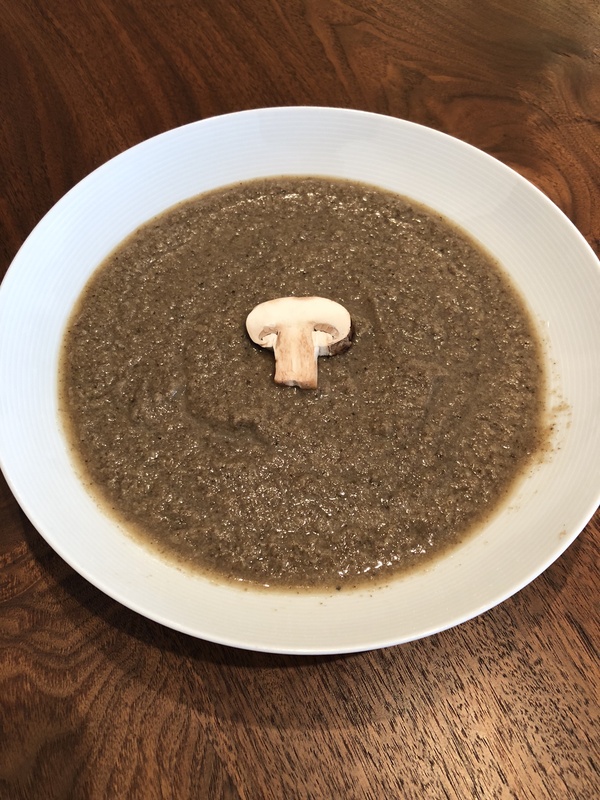 My thoughts are that fresh mushrooms, cooked or raw, are simply the healthiest way to reap the benefits because food in its natural, “unprocessed” state is always the best, nutritionally speaking. 1/2 cup white wine, wine you would drink! Hand Blender – If you don’t own one, here’s a good option! In a large sauce pan, sauté the chopped onions in Olive Oil until almost brown. Add the chopped mushrooms, the white wine and the garlic – sauté on medium heat for 10 minutes or a little longer. The liquid that comes out of the mushrooms and from the wine should be reduced in half. Add the remaining ingredients – the mint, water, pepper and the coconut aminos – simmer for 35-40 minutes covered. Turn off heat, you can let it cool off for a bit it you want – put the hand blender into the pot (at the bottom) and blend until creamy smooth. Add more water if you think it’s too thick and add more liquid aminos for taste. Enjoy!